The Silence Review | Nerd Much? The Silence is a film with too many ideas shoved into one story. Released on Netflix, The Silence follows a family attempting to survive after an outbreak of mutated, killer bats are mistakingly released upon the world. Completely blind, the bats hunt by sound, meaning our protagonists need to slowly stumble their way through this world without alerting these beasts. If this sounds remarkably similar to last year’s A Quiet Place, you wouldn’t be wrong. But where director John Krasinki’s horror film delivered big scares, The Silence comes off as an unfocused, if well acted, mess. Our protagonist is a deaf teenage girl Ally (Kiernan Shipka) that lost her hearing in an accident a few years prior to the film’s setting. While she can talk, Ally largely communicates in sign language and fourth wall breaking narrations to the audience. Except the later only happens a few times randomly throughout the story, which can be a bit jarring and doesn’t serve any purpose except to dump exposition on the audience. 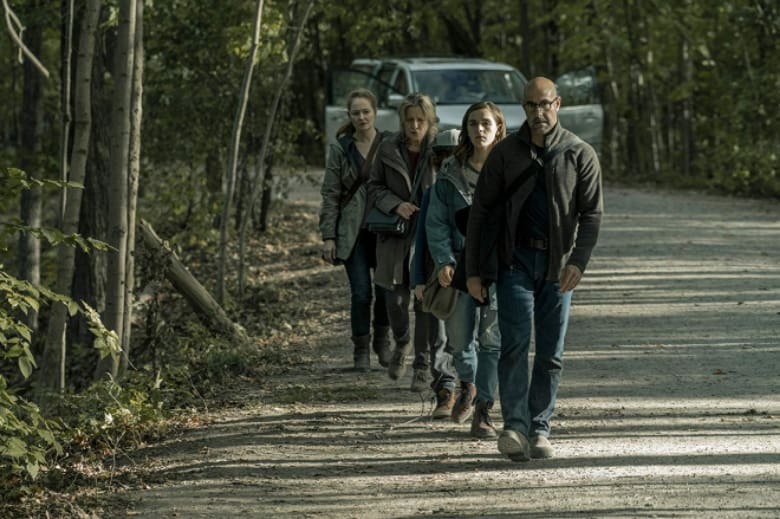 However, Ally isn’t alone as she attempts to escape the tsunami of mutated bats – here called Vesps – with her father Hugh (Stanley Tucci), mother Kelly (Miranda Otto), brother Jude (Kyle Breitkopf), and grandmother Lynn (Kate Trotter). 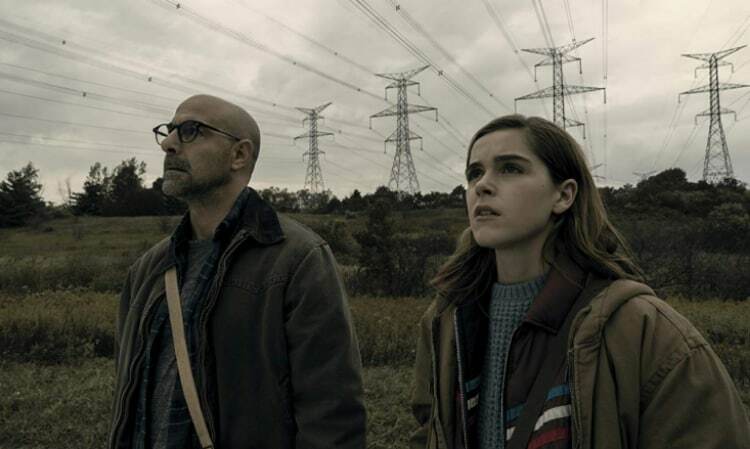 The entire group has solid chemistry, especially Tucci and Shipka who really sell the father/daughter relationship. The duo plays off one another well and Tucci especially portrays an intriguing take on a family man pushed to be colder in a collapsing world. The rest of the family are different levels of forgettable, with the brother really not adding much to the story. Breitkopf is fine here, but he really doesn’t serve the plot and grow in a meaningful way. There’s also a sub-plot involving the grandmother’s health that doesn’t get enough time to make the big emotional gut punch at the end stick. A lot of this is due to the surprisingly conservative runtime of 90 minutes. The Silence never gives its audience time to breath once the bats arrive. Our characters are just shipped from one frightening situation to the next without any time spent to really dig into the world, beasts, or people in it. This makes establishing any sort of a connection to the core cast difficult, especially Ally’s love interest who communicates with her via text messages and Skype. He’s absolutely forgettable and his inclusion is hamfisted into the plot because apparently what the mutant bat monster film needed was a teenage romance. There’s also a cult that worships the bats thrown into the story about halfway in that is half baked at best. Instead of delivering more tense scenes around the monsters, director John R. Leonetti offers up a group of individuals that don’t offer anything to the story. They come in too late to be meaningful and feel really out of place when you think about the film’s timeline. It’s as if Leonetti doesn’t have enough confidence in his core idea, so he decided to just try another scary element you find in this type of sub-genre. For a movie about flocks of giant bats eating people, The Silence takes itself very, very seriously. There are no jokes or even an ounce of gallows humor. This is a dark movie and it will go to comical lengths to ensure the audience knows this. Given the entire premise is something you’d expect to see on the Syfy channel in the middle of the night, The Silence is way too scared to poke even a little bit of fun at itself. It doesn’t help that the film kind of just ends and doesn’t really resolve any issues around the monsters. Speaking of the bats, they are hands down the best part of The Silence. Their designs are wicked, coming off as a cross between bats and pterodactyls. Even though the CGI can be pretty bad at times – especially in the daytime – these winged vermin pose a serious threat. Leonetti does a good job establishing the different rules for these monsters and how to defeat them. This allows certain scenes to really flourish as our heroes try to figure out how to get from point A to point B without alerting any of the Vesps. It also helps that The Silence is more than willing to let the blood and guts fly when it needs to. There was a surprising amount of violence on display, but it’s never overwhelming. Leonetti instead uses the bats more as a force of nature and less an individual monster stalking our heroes. Think of it as a disaster flick with a massive earthquake swapped for giant, angry bats. This does help create some nice shots of the swarm from the distance, but ultimately robs the monstrosities of being scary. Sure they are visually scary, but The Silence doesn’t do anything to really enhance the terror or deliver unique scenes based around the idea of not making any sounds. Somehow The Silence makes giant killer bats boring. While the general cast gives solid performances across the board, they aren’t enough to save this film. With mediocre CGI, a lack of inventive scares rushed story, and comically haphazard third act, you’ll be praying for the bats to come devour you. If you’re looking for a solid horror film on Netflix just give this one a pass.